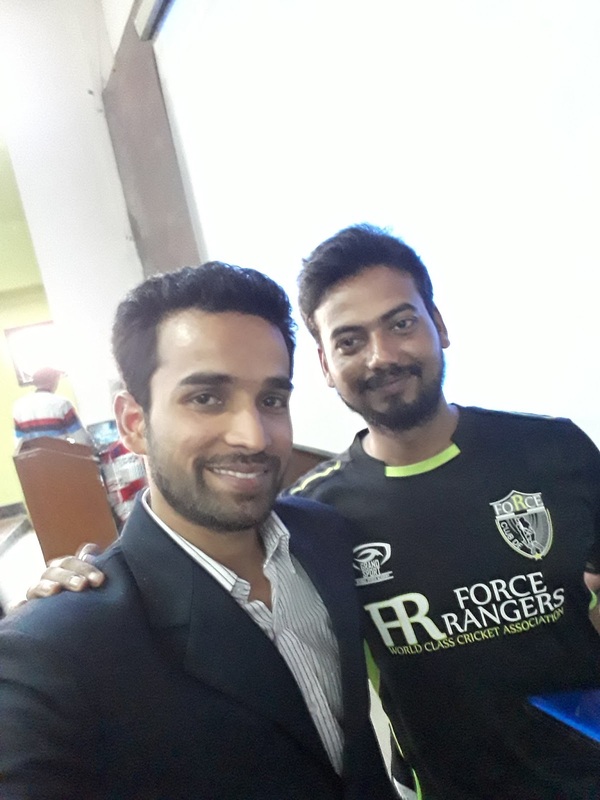 Home Guest Speakers Mr. Arvind Mishra - That’s How Change Looks Like. Mr. Arvind Mishra - That’s How Change Looks Like. 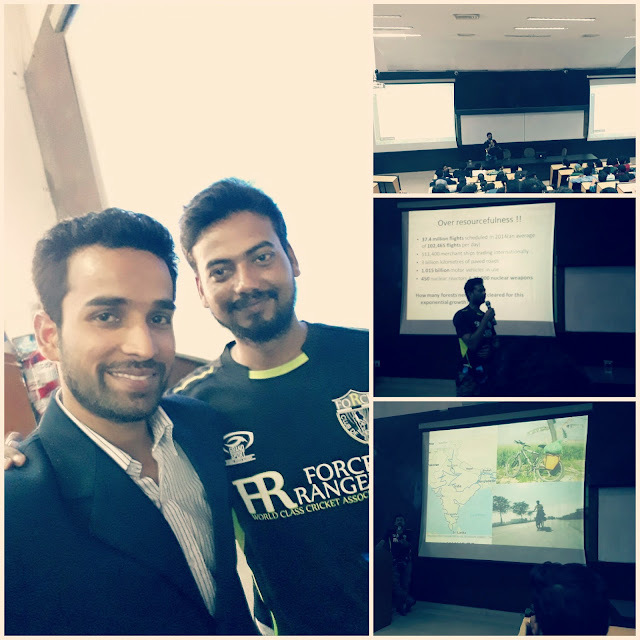 Lectures were going on, but I chose to attend his Guest Lecture in Block 29-402 with a hope to learn something which I don’t learn in my daily routine. While we were waiting for him, I looked at his Banner for the event which made me feel that he is a person who creates his own way. Before he could began addressing the Audience, the anchor of the event gave his introduction which lasted for more than 3 minutes, by now, my expectations from his speech already went high. Few moments later, He began with his speech. He greeted us with complete enthusiasm and cleared his expectations from the audience. He was in almost a complete Sports outfit. First and Foremost, he talked about the Spine Injury he had in 2010. He was told that he was paralyzed and will not be able to walk again. He did not lose hope. Clearly, he was standing in front of all of us so he stated that he won’t talk much about how he got treated yet he diverted the subject to how he won two Guinness World Records. He told us that he began giving his lecture on March 1, 2014 which lasted for 139 hours 42 minutes and 49 seconds, closely for 6 days and 6 nights. He broke the record of Polish law Graduate Mr. Errol Muzzawazi, who lectured on democracy, at Jagiellonian University, Krakow, for 121 hours. 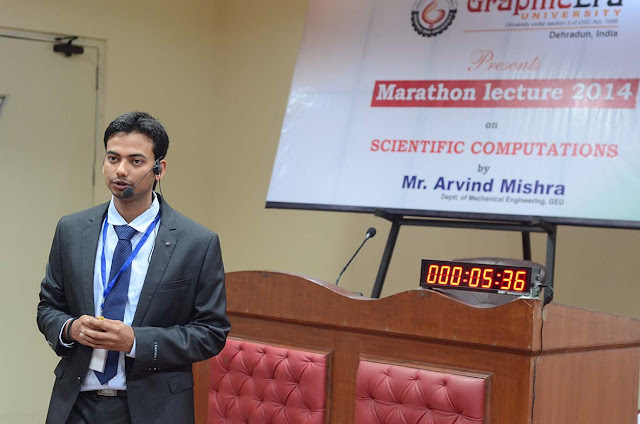 Arvind Mishra superseded his record on 6 March at 07:01:00 AM. Subsequently, he talked about existential crisis due to which he resigned from his current job and stated that Teachers must be aware about what Existential Crisis was. “How many of you are Engineers here?”, he asked. After some students raised their hands, he said that they must be knowing that the engineers have an habit of over-analyzing things and he used to do the same. Finally, he came to the main agenda of his visit when he talked about Global Warming, Supply Addition Nutrition, Variables of Love and Change. 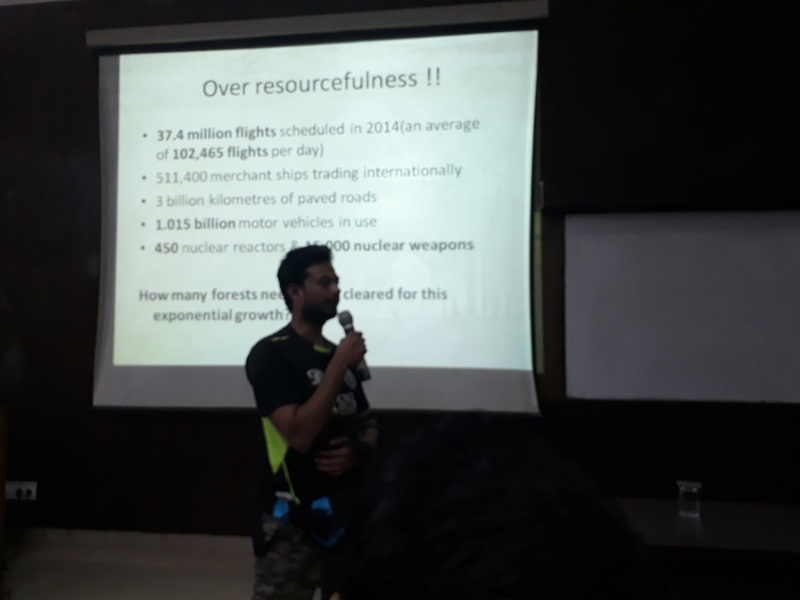 He shared some of the facts and figures including the rate of Glaciers melting every year and 40 percent increase in level of Carbon Dioxide in 150 years. He explained how much important it is to change this scenario. In addition, he told about Observatory and Annual Water Melt rate and how much distance it is covering every year i.e. 17 meters. He also talked about Premier Institute of India, Treeline Velocity, Reduction in Foreign Exchange Reserves, ISRO and the effect of Global Warming on them. He stated that these Ministries are interrelated, yet political agenda does not talk about the climate change. As per the slide shown, eleven of the world’s largest cities lie along shores, such as New York, Mumbai, etc. at the end of the slide, the question was asked, “How many forests need to be cleared for the exponential growth. 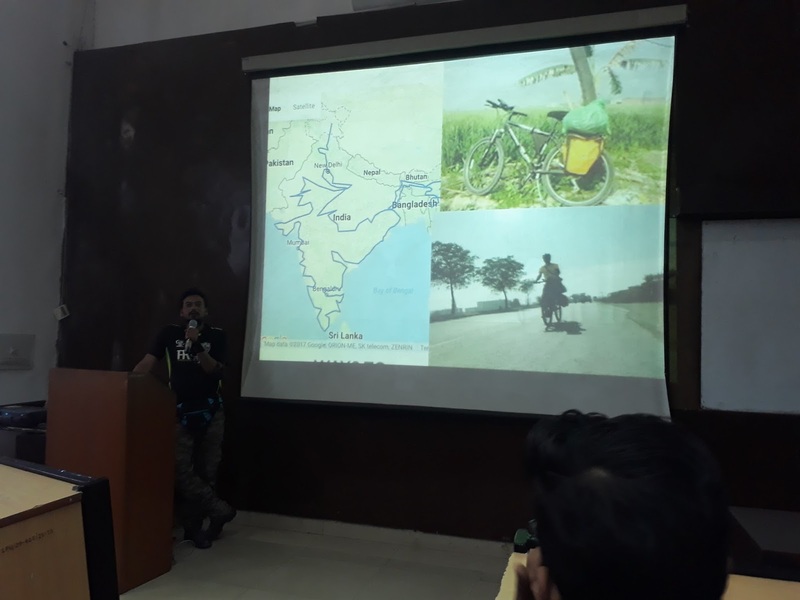 He travels in different states in India via cycle and do cycling for around 350 Km per day. “How old are you? 20-22 years. “, he stated. “Have you ever planted any tree and made sure that it would grow for a longer period of time?”, he continued. Now, he began with C-negative Campaign explanation. He took an example if we buy tea every day and assuming 65 days as holidays, we dispose off 3000 cups of tea cups and how many in 10 years. He suggested us to carry a small glass every day and use it for the tea, by which we can save thousands of disposable glasses which will ultimately help our environment. ‘You guys Google a lot, just type ‘Ecosia’. We typed and meanwhile he explained that it is a search engine that plant trees and up till now, it has planted over 64 lakh trees. He added the term Green Hosting Companies along with it. 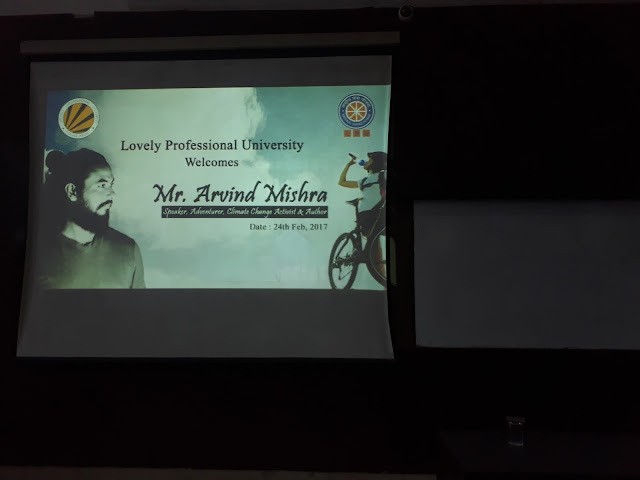 He recommended us to visit www.arvindmishra.com and subscribe to join the movement. “It is your accountability. Some of you may ask, “you travel India, do you think it will change anything?”. I don’t know if I would or not, but when I die, I will know that before dying, I planted 10 Lakh trees and done something worthy in my life. I don’t expect much from you but only 20 percent success rate. He then showed the PDF for smart week plan. “Light a candle on Wednesday evening, you will have a candle light dinner with your family.”, he stated. Finally the session was open for audience to ask queries. Few more students asked some queries for which he shared his views on Nationalization and his experience on his visit to Pakistan 20 days ago. He said that they have Government Studies and History of Pakistan are one of their compulsory subjects. Later, He talked about China. After few minutes, Ankita asked him how did he manage to deliver such a long lecture. He explained how he tested his endurance every now and then, by travelling 350 Km per day via cycle. He also gave a statement that anyone who decides to break his record can do it. “I believe my body is pure. I don’t eat Junk Food, I don’t take oil in any meal, etc.”, he continued. To that, he said that he visits different villages personally for the same and grow Pot Vegetables. Finally, a student stood up and asked, “You suggested us to demand less, as I am a commerce student, I believe if there will be no demand, there will be no supply and therefore, there will be an unemployment. 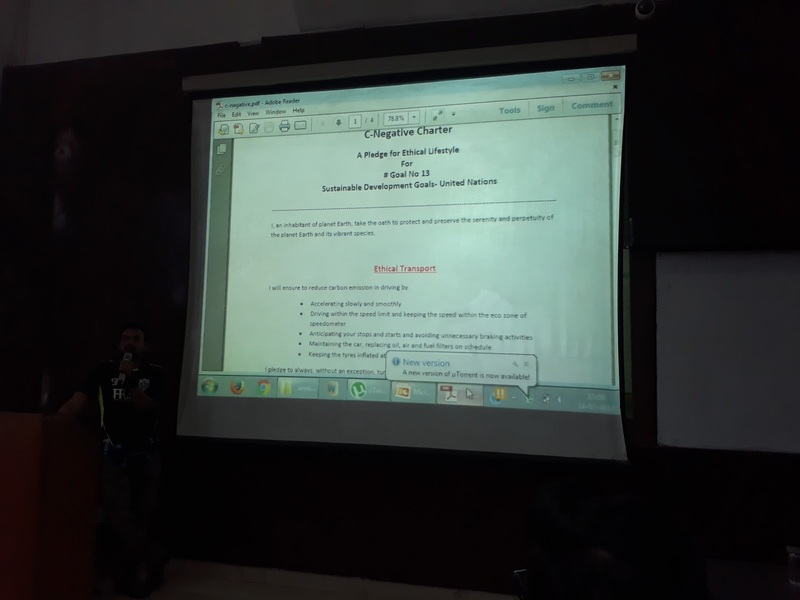 Even though, he was able to answer his queries and shared some examples like Elon Musk for his ethics and https://ecofemme.org/ , it took one more teacher to explain that student about his concepts and intentions. By this, the lecture came to an end. Hope this article must have added some value in your life.